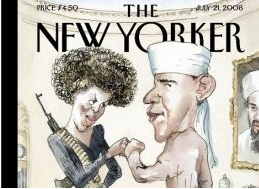 This entry was posted in cultural studies, politics and tagged Barack Obama, Barry Blitt, Images and Media, Michelle Obama, Myth Today, The New Yorker by hector. Bookmark the permalink. To be honest, I am not really a critical member of the public. I guess I had this vague idea of the power and control of the media, but I never thought about it seriously or had specific examples until professor Vila talked about it in class. As Barry Blitt said himself, he was probably trying to show the vulnerability of the people, how easily they are influenced by things they hear and see. He was trying to be sarcastic, thinking ‘look what you people believe. Do you think it makes sense at all?’ Many people have criticized Blitt and expressed their opinions about the cartoon and I neither agree with him nor disagree. I think he was successful in affecting many people with different points of view, whether it was his purpose or not. He put the rumors that have been going around all in one picture, he made people-who thought Obama was not the right guy because he might be Muslim and related to Osama-feel guilty, he made people on both Obama and McCain’s sides feel weird, he made Americans think about the role of media and also the challenge they face. Talking about the media as a whole, nobody can actually prevent it from being biased or showing only parts of what is true. This is sad considering how huge the impact of media is.